This ultra-compact PC with a stylish glass surface chassis design is ideal for various computing applications at home or in the office. 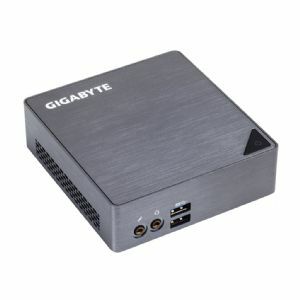 The BRIX sets a higher standard for desktop miniaturization that makes it perfect as a discreet HTPC/multimedia hub, an ultra-low power PC for the family, an office PC or as a digital signage unit. With support for HDMI and DisplayPort, the BRIX can power two displays simultaneously, making a perfect solution as a high-productivity PC in professional and home environments, or in any number of industrial and commercial multi-display applications. Gigabyte logos are registered trademarks of Gigabyte. All others trademarks and copyrights mentioned herein are the property of their respective owners.